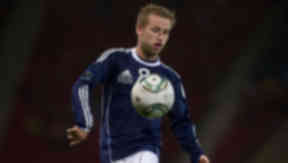 The Aston Villa midfielder was Scotland's star man as they recorded a 1-0 win over Lithuania. Barry Bannan has revealed his enthusiasm at being told he was making his first competitive start for Scotland, and says he carried his excitement forward into a man-of-the-match performance. The Aston Villa midfielder was a creative spark throughout his country’s 1-0 win over Lithuania on Tuesday night, setting up Steven Naismith for the winning goal in the Euro 2012 qualifier. Bannan was making his seventh appearance for Scotland but his inclusion marked his first competitive start and the 21-year-old was satisfied with his contribution. “It's brilliant,” said Bannan of his Hampden outing. “First and foremost to get the victory after Saturday was a must and I'm happy with how I played as well. “It's a dream come true, I've been waiting for this for ages and for it to come so early in my career is incredible really. “I don't really get nervous. I'm like a young boy at 13 just looking to go out and play. When the gaffer told me I was starting I couldn't wait to go out there and play. Bannan started on the right flank for Scotland and terrorised the Lithuanian defence, sending in a number of dangerous crosses and working well to engineer moves through the heart of midfield. His performance now leaves manager Craig Levein with a dilemma whether or not to keep him in his starting line-up for the double header with Liechtenstein and Spain in October and Bannan hopes he can now kick on at club level to make the decision easier. “Tonight has done me no harm, starting in a big game like that and the gaffer [Alex McLeish] will probably be watching,” he said. “He has been brilliant for me, I came on first sub the last game.